There are an increasing number of fakes being manufactured of rare date coins, recently manufactured to a high standard. 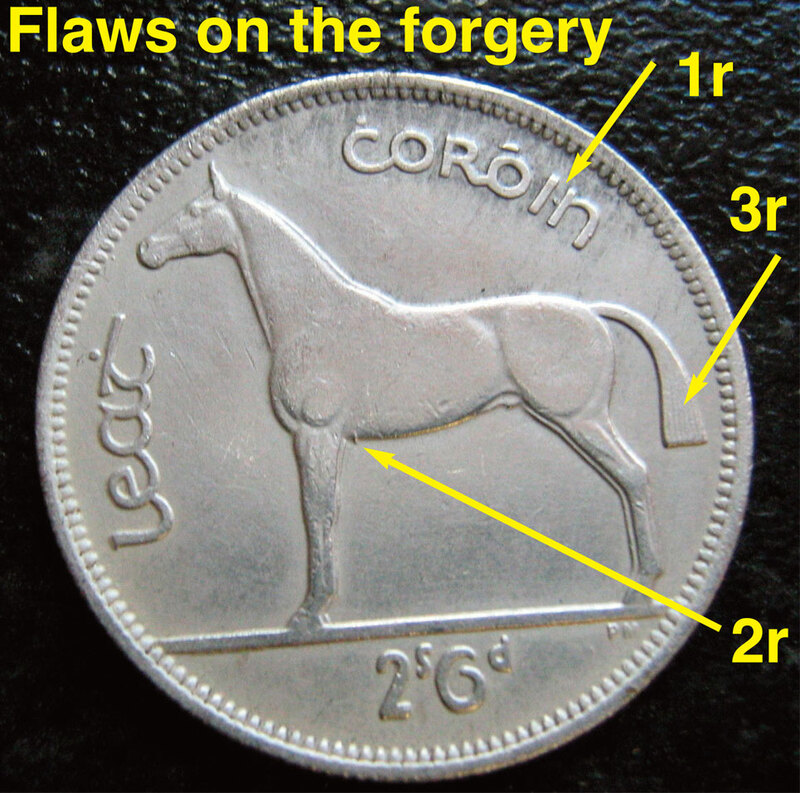 Check the Irish coinage website for high quality reference images of genuine coins if you are in doubt. Fakes of the 1995 20 Pence coin exist—first seen in October 2014. Fakes of the 1943 Half Crown—first seen in February 2015. Four seen so far, all high grade, and all with the same flaws, thus from the same dye. Several have appeared on ebay, offered as replicas. Fakes of the 1937 Half Crown—first seen in November 2015. One seen so far, high grade, as detailed below. See below for photos of a good forgery of a 1937 Irish half crown. It was on sale on ebay in late November 2015 for a Buy It Now price of $850. Over 1,000 people had viewed it and the listing was to finish on 29th December. The seller was advised by a member of the Numismatic Society of Ireland that it was a fake. Seller had genuinely not realised it was a fake. It was the only such coin he has for sale. He said it was part of a large collection he had purchased 3 years ago, did not realise it was a fake and promptly ended the listing. As you can see from the photos below the coin has a grey metallic appearance rather than a nice silver colour. The overall design is also weak and the “wear” is uneven. This is the best fake 1937 2/6 yet seen. Other 1937s had a split in the line under the horse above the “6”. 1. Line under the horse (under front hooves) has been reshaped or touched up. 2. Weak design; lower legs of the horse and the shéibhiú or dot over the “c”. 3. Small raised blobs of metal beside the tail. 4. Indistinct lines on the tail.